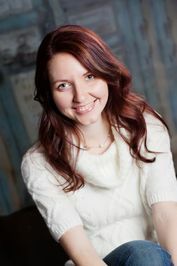 Ellie Cahill is the author of the Cordially Invited series, including I Temporarily Do, as well as stand-alone romantic comedies like When Joss Met Matt, Call Me Maybe, and Just a Girl. Ellie is also the not-at-all secret pen name of Young Adult author Liz Czukas (Ask Again Later, and Top Ten Clues You're Clueless). Liz's books are often compared to John Hughes movies, while Ellie usually gets compared to Nora Ephron. Either way, if you like a good 80s rom-com, you've found the right place. When they're not writing fun, funny romances full of shenanigans and awkward kisses, Liz and Ellie are at home with their family and a golden retriever with different ideas about the definition of "dog bed." You'll find Ellie on Facebook and Twitter (@ellie_cahill) but you'll more easily find Liz in those same places as well as Instagram and Tumblr. You'll find either one of them parked in front of the TV every Sunday night getting their fill of Zombies, Westeros, The Doctor, or any other place where cute English guys fight evil. Speed round: sweet tea, Hufflepuff, dark chocolate, cheese is the perfect food, Go Badgers, and Han shot first. To ask Ellie Cahill questions, please sign up. “You know, at a fancy restaurant, you get sorbet between courses. To cleanse your palate.